Video of female reporter being brutally slapped on live television by a Pakistani national guard goes viral inciting angry protests from people on social media. 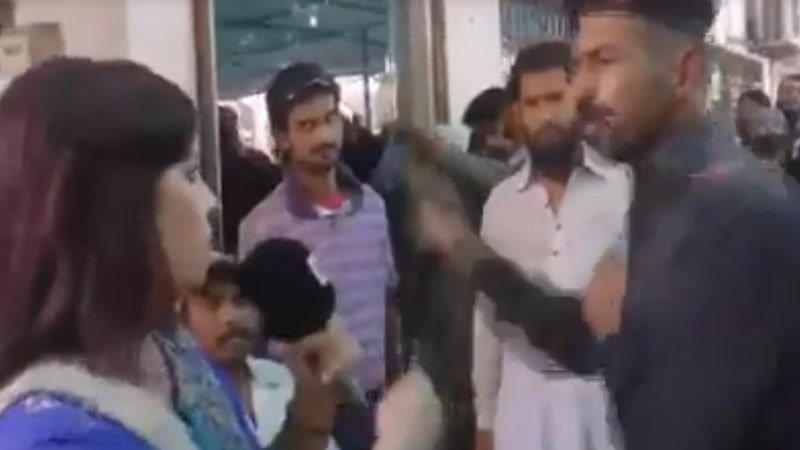 Saima Kanwal, reporter with Pakistani news channel K-21 was doing a live report on the problems faced by the peoples at the Nadra registration center in Karachi when a Pakistani Frontier Constabulary trooper deployed as a guard slapped her face. Frontier Constabulary personnel first tried to stop the news reporter Saima Kanwal from entering the premises of the Nadra registration office and then the guards tried to stop the cameraman from taking the video footage of the office area. Meanwhile, Saima Kanwal started asking questions with the security guard about why he had been misbehaving with the women present at the registration office then suddenly one of the Frontier Constabulary guard slapped her very hard and also fired his gun in the air. The video of the incident with the Pakistani new channel reporter subsequently went viral. A police case has been registered against the Frontier Constabulary guard. Nadra registration office has also filed a counter complaint against the news channel reporter for creating hindrance in their official work.